Discover the Simple Step-by-step Exercise Routine That Will Finally Rub out Heel and Foot Pain in 12 Weeks! If you are interested in eliminating your own plantar fasciitis or have a client with plantar fasciitis and are looking for a fast, simple, safe and effective exercises routine that most health & fitness professionals don’t know about or are doing wrong, then read this important letter. My name is Rick Kaselj. I am an exercise and injuries specialist and international presenter for effective exercises for injuries. 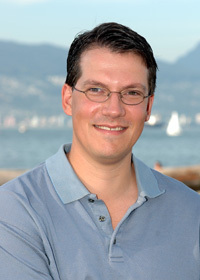 I have written numerous articles that have appear in magazines, fitness association magazine, written leading exercise injury manuals in the fitness industry and taught over 256 presentations to 5021 fitness professionals and across Canada and the USA. 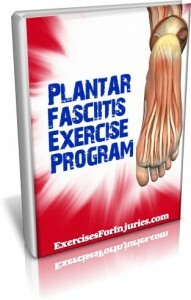 I’ve developed the Plantar Fasciitis Exercise Program to help you solve your plantar fasciitis. The Plantar Fasciitis Exercise Program is a combination of 6 years of University study (including a Master’s Degree in Exercise Science), 16 years of hands-on experience, constant search for the best plantar fasciitis exercises, also teaching these foot pain exercises to thousands of other fitness professionals that have used these exercises to help their clients, plus 1000s of personal training session with clients with foot injuries and the careful scrutiny of 21 medical research papers. It all started in 2001 when I went hiking for a week. I was wearing hiking boots and a heavy pack. Carrying a heavy back and wearing poor footwear like hiking boots, flared up my feet and my heels. Since I was way out in the bush, there was not much that I could do. I had to keep walking on my feet in order to get through the hike and back to the car. Every morning I would wake up and dread the first step of the morning. With that step I would have sharp and unbearable pain into my heel and the bottom of my foot. It got betters as I walked around but when I put on my heavy backpack, the pain in my feet and heels would return and magnify. I tried popping pills from the first aid kit but that would only provide me with temporary relief and the burning and jabbing pain would return. My hiking partner showed me some stretches he had heard about that helps with foot and heel pain. The stretches did nothing and if anything, they made things worse. When I got back home, I headed to physical therapy. They gave me some exercises and put machines on my feet. The machine felt good but when I walking again, that feeling came back in my feet and heel. They also gave me some exercises to try. The exercises they gave me didn’t even touch the pain and took way too long to do. I headed to my doctor and she told me I had plantar fasciitis. She gave me some goofy thing to wear at night that prevented me from sleeping. I was about to give up and look into getting surgery. I decided to give myself one more month and see if I could find a solution. I began to do research in the medical journals and came across an article that changed all of my thinking. Thankfully I am a bit of a research geek and my search through the journals turn up what I needed. I implemented one thing from the research paper and it rubbed out my plantar fasciitis. I have been able to return to hiking. I wake up each morning with no foot pain. I have shared these tips and exercises with my clients and fellow fitness professionals. Now I am so excited to share it with you. “The best thing about the plantar fasciitis program for me is that it is easily understood by the patient and that the exercises itself is very easy but still very effective. Question: I have been told that I need to strengthen my plantar fascia? Strengthening your plantar fascia won’t help with your plantar fasciitis. The plantar fascia is not a muscle, it won’t get stronger if you do strengthening exercises to it. It will get irritated and the foot and heel pain will continue. You need to do tissue specific exercises for the plantar fascia but not strengthening. I wanted to say this program will help you in 4 weeks and I know it will. In fact, I know your plantar fasciitis will feel better in 7 days if you follow this program. The reason why I say 12 weeks is If you want the plantar fasciitis to be gone for good, it will take 12 weeks to do so. I did not want to give you a temporary fix, I wanted to give you long term relief. In 7 days, you will feel a difference in your foot and heel pain. In 4 weeks, it will feel like your plantar fasciitis is gone. In 12 weeks, your plantar fasciitis will be gone for good. 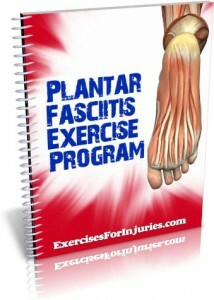 Question: I have a bunch of exercises that I have been given to me for plantar fasciitis? Most of the exercises that are out there, do not focus on the plantar fascia. Most will focus on the calf or soleus muscle. It is important to do this but it is not the most effective way of improving your plantar fasciitis. You must do fascia specific exercises and not just calf and soleus stretches, in order to overcome plantar fasciitis. A video guide is a recorded video presentation that you can download to your computer, burn to a DVD or view right off the internet. You can download the webinar at work or at home and view it when it is convenient for you. After getting the Effective Plantar Fasciitis Exercise Program, you will be directed to details on how to access the video guide. Along with the video guide, you can download and print out a detailed handout of the video presentation. With your handout in hand and video guide on the computer or iPod, you are ready to overcome your plantar fasciitis. You can watch the video presentation at your own pace and re-visit any aspects of the video presentation when you like. You can download the video presentation to your computer and then burn the video webinar to a blank DVD. Question: I was at a fitness site and watched a free video presentation. The free video presentation did not have much substance to it? I find free video presentation don’t have content that is very helpful. They are often full of useless information or just promotion of a more expensive products. This a content rich video presentation! I give you tones of information on plantar fasciitis and exercises that you can use with right way. Question: I have watched a video presentation before and could not download or burn the webinar to a DVD? Most of the video presentation you have to sit in front of your computer and watch the full presentation. Often times you lose the internet connection to their computer and have to start all over again. This is very frustrating, a waist of time and very inconvenient. Plus, most video presentation you can’t download the video presentation, you can’t burn the video presentation onto a DVD, you can’t skip to the best part of the video you would like. This is NOT the case with the Plantar Fasciitis Exercise Solution video presentation. You can download, burn and skip to any part in the Plantar Fasciitis Exercise Solution video presentation. Question: Are there videos of the plantar fasciitis exercise? I go through all of the exercises and point out the key things so you get the most out of the exercise. What is in the Plantar Fasciitis Exercise Solution? In this video presentation, it is in a guide format to help you with your plantar fasciitis, right away. I take you by the hand and explain all you need to know about plantar fasciitis. I take the time to educate you on what plantar fasciitis is, little known causes of plantar fasciitis, why most exercise program do not work for plantar fasciitis and an exercise program you can do at home in about 10 to 15 minutes that will put you on the path to a pain-free heel and foot. This builds on the video presentation and give you the full look of the program and how it works. This is your 12 week solution. I outline the goal of each of the stages, the exercises and how to do each. As I said above. You will have an improvement in 7 days with your plantar fasciitis, in 4 weeks you will feel your plantar fasciitis is gone but in order to have it gone for good, it will take 12 weeks. This is your color guide to the program. You can print this out and it will be your reminder of how to do the exercises. You can keep it by your bed or by your couch so you can quickly refer to the exercises and do them when it is convenient to you. I got asked this by a friend, “If there was one stretch that I could do, to help my plantar fasciitis, what would it be?” Here it is. I go through the one stretch that you have to do in order to overcome your foot and heel pain. You will get the fastest and most benefit if you do the full program but if you are in a rush, you can do this one stretch and get a good amount of the results. Most exercises you will get for plantar fasciitis, don’t hit the plantar fascia. They work around the plantar fascia. You need to do exercises that target the plantar fascia but don’t make your foot or heel pain worse. These exercises do that. In the videos of these exercises, I show you how to do the exercises right for maximal results. I show you exercises that help relieve your foot and heel pain. I guide you with video on how to to them will common stuff you have around the house. I take you through exercises you can do a home that help self massage your lower body which helps overcome plantar fasciitis. This is the most often overlooked thing for plantar fasciitis. 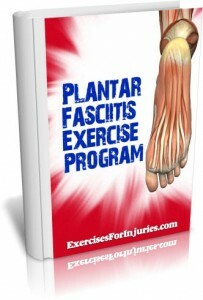 Click here now to order The Plantar Fasciitis Exercise Program for $97 $47. In 7 days, if you don’t feel a decrease in your foot and heel pain, You Get Your Money Back! If that is Not Good Enough, Try Plantar Fasciitis Exercise Solution For The Next 60 Days With A No-Risk, 100% Money Back Guarantee! “Test drive” the Plantar Fasciitis Exercise Solution for the next 60 days with absolutely no risk so you can fix your plantar fasciitis, foot pain and heel pain. You can feel completely safe because you are protected by my iron clad 100% money back guarantee. You will not only be satisfied, I guarantee you will be thrilled and amazed with the Plantar Fasciitis Exercise Solution, or you can simply email me and ask for a prompt and courteous, no hassles, no questions asked, 100% refund. In fact, if you’re not completely happy for any reason at all, then I insist that you ask for a refund. However, after seeing so many men and women improve their plantar fasciitis in a quick and effective manner, I am confident that you will be thrilled as well. P.S. – There is NO RISK at all for you when you try the Plantar Fasciitis Exercise Solution. If you are not thrilled how this program decreases your plantar fasciitis, foot pain and heel pain, let me know and I will refund your order. Your satisfaction is 100% guaranteed. Rick Kaselj has been trusted by the largest fitness & rehabilitation associations in North America (NSCA, ACE, CanFitPro, BCRPA, BCAK, CKA, NHPC). P.P.S – If you are sick and tired of not know what to do about your plantar fasciitis, now you can find out. P.P.P.S. – There’s only one catch to all this. You need to act now to get the complete bonus package along with the exercise program (including the valuable workout and client handout). With all of the new bonuses I’ve just added, I’ve been told this package is way too cheap now and the price will be going up very soon. So, if I decide to keep the price the same, the bonuses may be withdrawn at any time and put up for sale separately. 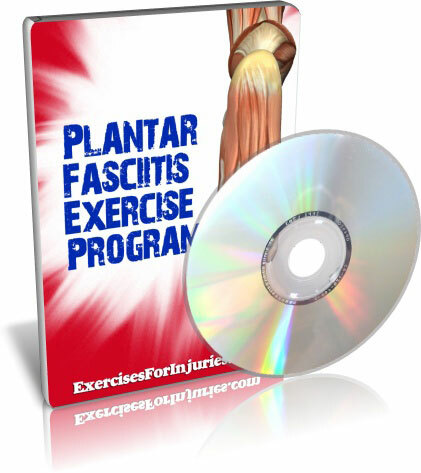 NOTE: The Plantar Fasciitis Exercise Solution is a downloadable video and e-book. No physical products will be shipped. After you order, you will get INSTANT ACCESS to download the video and e-book. The e-book format is adobe acrobat PDF, which can be viewed on Mac or PC. The video format is MP4 which can be viewed on Mac or PC. If you have any questions or need help, you can contact us at support@ExercisesForInjuries.com.